This KFC Zinger Sauce Recipe in combination with our KFC Zinger Burger recipe produces a truly tasty spicy chicken burger! You can find our full KFC Zinger burger recipe here. Combine that recipe with this sauce for a delicious Zinger burger! This recipe is a simple one step process. 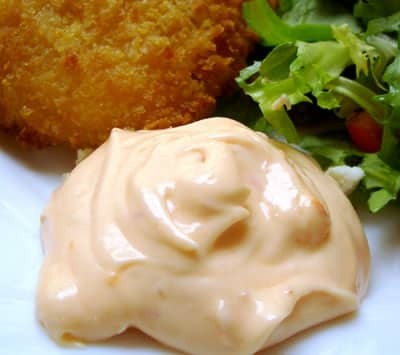 Simply mix Tomato Ketchup, Mayonnaise, Chilli Garlic Sauce, Vinegar and a pinch of Salt in a bowl. If you are feeling a little braver and would like a touch more heat add a small amount of Crushed Red Chilli.